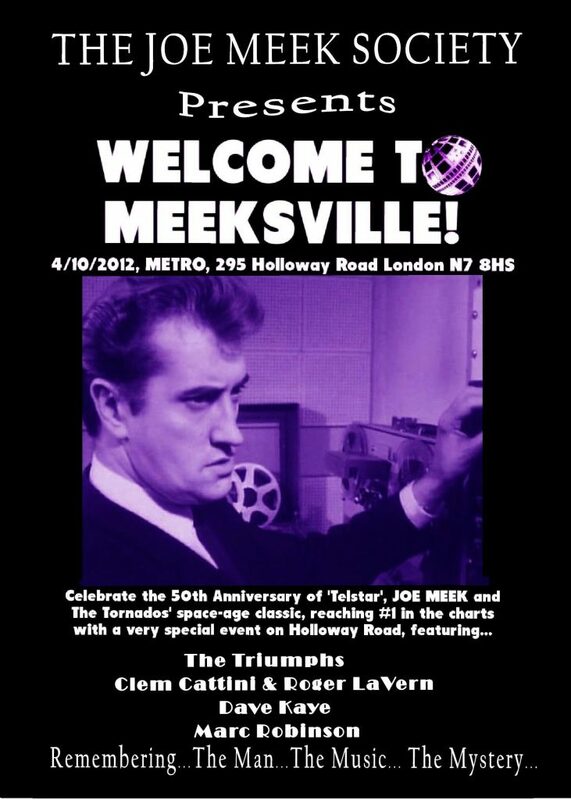 Available to Joe Meek Society members only – it’s worth joining just to get your hands on these! 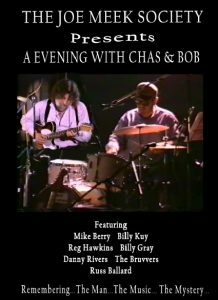 Please note that with the exception of The 40th Anniversary Concert which was professionally filmed and edited, and An Evening With Chas and Bob which is of higher quality, the original source material on the other DVD’s is from hand held cameras and VHS and therefore the picture and sound quality is of that standard. With this is mind, the prices have been kept low. 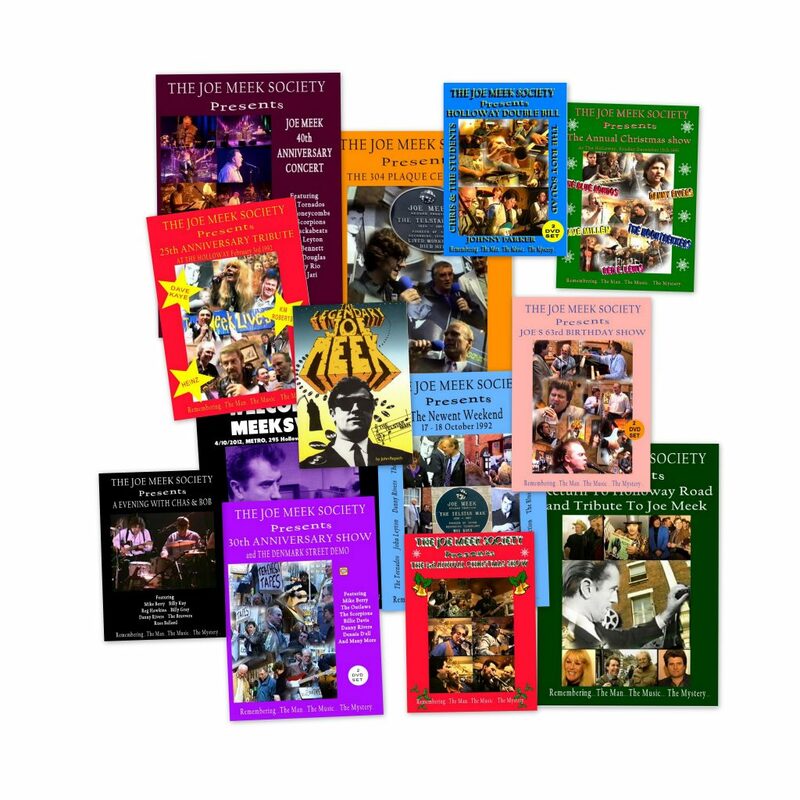 However these DVD’s contain many one off performances, and sets from artists who are unfortunately no longer with us, making them essential. All prices include post and packaging. Any problems with shopping cart please contact us. Should you wish to pay via cheque or bank transfer or in a different currency please contact us for details. 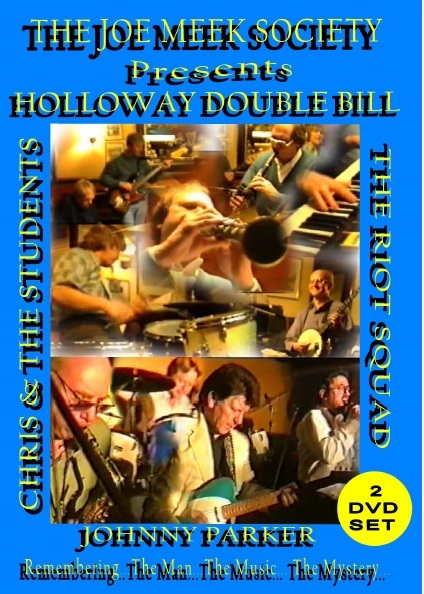 A great afternoon was had by all at our annual Christmas show as The Holloway, in Holloway Road. 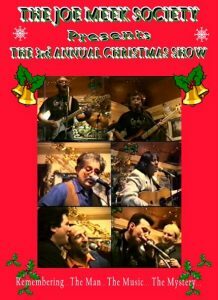 On December 15th we were treated to performances by old favourites The Moontrekkers and Danny Rivers, as well as the Puppets’ Dave Millen and, after a 26-year rest, a re-formed line-up of The Blue Rondos. 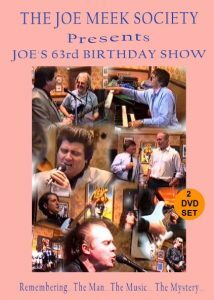 This DVD brings you a double dose of Meek nostalgia with a record 38 numbers. 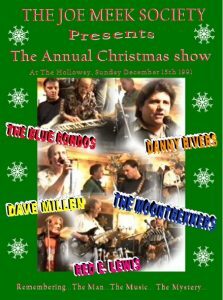 Christmas 1993 saw Trad Jazz come to The Holloway. Fine fingered boogie – woodie piano player Johnny Parker, set the mood with solo rendition of the classic he is probably best remembered for. “Bad Penny Blues”. The Appearance then of Chris & The Students was a real scoop. Although they are still playing, this was their first time together since 1961, and some of them were wondering if they would recognize each other! To see musicians reading from sheet music certainly added a touch of class to the proceedings and they soon captured that unusual and irresistible “Trad – Rock” sound. As Chris Williams Said: “It all came back as if it was yesterday”. In February 1994, we commemorated Joe’s passing by getting The Riot Squad to re-form after 27 years. Introduced by Clem Cattini, they enjoyed it as much as we did, and their superbly energetic performance, including all their RGMs, along with a smoke machine and their distinctive blue, flashing police lamp, demonstrated why they were the Meek band to watch out for in 1966/67. 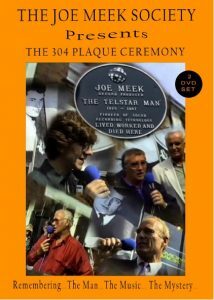 August 29, 1993 was the date when Joe was at last given official recognition for his importance to our musical heritage by the way of a memorial plaque at his Holloway Road Studio. Approval for the placing of a plaque had been granted by the borough of Islington’s Planning Department, and a crowd of around 120 were in attendance. After an Introductory speech by John Repsch, outlining Joe’s highly influential career, there were poignant and hilarious reminiscences from Mike Berry, Charles Blackwell, Clem Cattini, Roger LaVern, Bob Kingston and a short speech from the Mayor of Islington, Cllr Anne Gilman. Following the unveiling by Joe’s niece Sandra Smith, we were treated to Mike Berry, Billy Dean and a most unusual line-up of the Outlaws playing the afternoon away across the road at The Holloway, with a celebratory torrent of RGM songs, instrumentals and standards. Many thanks go to the cameramen Brian Ward, Philip Hutchinson, Tony Brown, Roger Smith and George Stapley, whose five cameras captured a mesmerizing array of shots and angles. Their footage of fans, passer-by and characters such as comic Arthur Mullard, all helped preserve the happy and expectant atmosphere of this historic event. Barnstorming through a string of rock ‘n’ roll classics were Mike Berry with Bob Graham, Reg Hawkins and Bill Kuy of the original Outlaws, and guest member John Barber. Other stand-out performances included The Scorpions’ “Riders In The Sky”, Dennis D’ell’s “Roll Over Beethhoven” and Danny Rivers’ “Little Sister”. Well known names were in abundance. 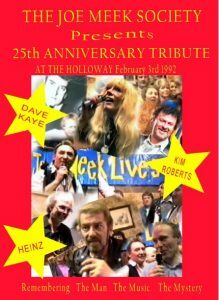 Besides those jamming, you may spot in the audience Bruce Welch, Jet Harris, Robin Sarstedt aka Wes Sands, Peter Cozens from Jimmy Miller & The Barbecues, Lional Howard, Robbie Duke and Tony Grinham. Meanwhile much of Joe’s career was on display in an array of photos, letters, news cuttings and recording equipment. That afternoon had marked the JMAS’s first involvement in direct action! 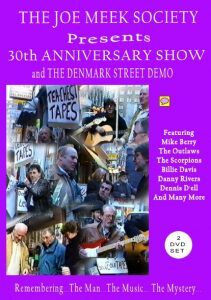 The longstanding deadlock over the ‘tea-chest tapes’ had prompted a demo in Denmark Street featuring some familiar faces in the guise of Loopy Cooper & his Tape Monkeys, alongside a stack of tea-chests. Playing Skiffle numbers and waving placards outside Cliff Cooper’s music store, the protesters embarrassed the elusive Mr.C into agreeing to a meeting which later extracted promises concerning the tape’s future home, but nothing more. For this piece of archive footage we are indebted to our man on the spot, Tony Grinham. Editing by Steve Fay, The picture quality is not up to our usual standard and contains some ‘picture roll’. 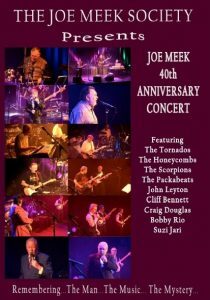 This was another line-up that had never before shared the same bill, but which gelled remarkably well when they came together to commemorate Joe’s 63rd birthday anniversary. Dave Watts, latterday Tornados keyboard and now one-man-Philarmonic Orchestra & chorus, soon seduced everyone into nostalgia by conjuring up much loved Tornados memories, including the unreleased “Footsteps On The Moon”. Tony Dangerfield & The Savages, who a few hours earlier had been blasting the night away with Screaming Lord Sutch, summoned up the strengh to get back up and do it again. It’s in the blood, you know. Young favourite Danny Rivers gave his usual high calibre performance. but it was with and uncharacteristically bluesy number in which he offered a memorable lesson in “Walking The Dog”, that he shone brightest. A show-stopper if ever there was one. As is clear to see, the show was deserving of a much larger audience but, as far as the old stalwarts who attended were concerned, it was without doubt an absolute treat. 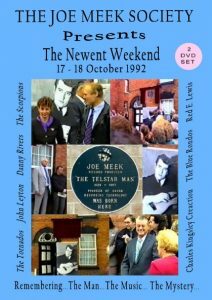 Timed to coincide with the 30th anniversary of Telstar being at No.1 in the charts, this remarkable weekend began at Newent’s Market Square, At 4pm on the Saturday, 200 people assembled outside Joe’s birthplace at No.1 for the unveiling of a commemorative plaque. A preliminary speech by John Repsch explained why Joe’s pioneering achievements and his rocky relationship with the record industry merited him the honour. Then brother Eric carried out the unveiling, it was a proud moment for the Meek family, the people of Newent and the JMAS. In the evening, the Telstar Anniversary show was held at the George Hotel. Taken the stage after dj Tony Chance’s warm-up were Danny Rivers, The Charles Kingsley Creation, Clem Cattini & The Tornados and ‘Suprise’ guest John Leyton. The lure of performing at an ideal venue in front of an equally ideal audience had proved irresistible to the actor/singer who had been contemplating a come-back after a 28 – year absence. The 200-strong turn-out loved it all. The following morning was more sedate. Joe’s niece Sandra Smith, conducted a sunlit walk around the most relevant Meek landmarks; the old cattle market and cherry orchard; No.1 High Street; Picklenash School; and Newent lake. A poignant visit to the Cemetery rounded off a memorable weekend. Where else could you see The Scorpions and Robin Sarstedt playing on the same bill? Probably nowhere. 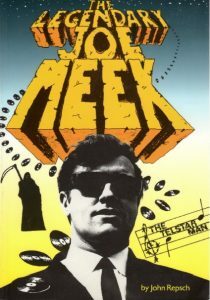 And that is just one of the delights of bringing together acts that were recorded by Joe Meek. Another one is in seeing them breathing new life into old songs that the JMS know so well, and which to the rest of the world are totally unheard of ! “Three Cups” is a prime examble, and starts off this dvd of musical memories. The infectious dueting of Robin ( Wes Sands ) Sarstedt and his brother Peter takes us through there hits, including the million-selling “Where Do You Go To My Lovely”, plus those of there brother Eden Kane. They are succeeded by The Scorpions who without a doubt are a top-class instrumental outfit, and their two showstoppers, “Swingin’ Low” and “Riders In The Sky”, are the ones to watch out for. When that long lost wanderer Gerry Temple joins them, he sounds nothing like Neil Sedaka-type he was on his records, But who cares when he can set the audience in stitches by describing how Joe made him practise the “Seventeen Come Sunday” chuckle’ for 2 hours? All this and the icing on the cake – an impromptu apperance by 50’s star Duffy Power with Danny Rivers on “Walking The Dog”. Well, that’s rock ‘n’ roll. 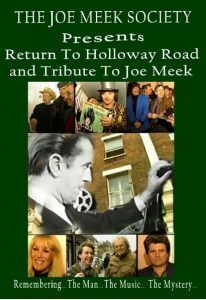 On Sunday November 10th 1991, 24 years after Joe Meek’s death, a hundred curious people made a pilgrimage to his famous Holloway Road address. For the first time, rooms which for most had been confined to photographs, film footage and vagaries of the imagination were suddenly there for real, hardly altered in lay-out since Joe’s days, and it was a matter of reinvesting them with an image of how they had once been. Walking the floors where he had walked, exploring the rooms where he lived and worked and where all those dramas had unfolded three decades past, seemed a little unreal and left people wondering how so much could have happened in so small space. But happen it did, and his artistes were there to verify it. The nostalgia, excitement and poignancy of this historic visit are captured here on this 31-minute recording.